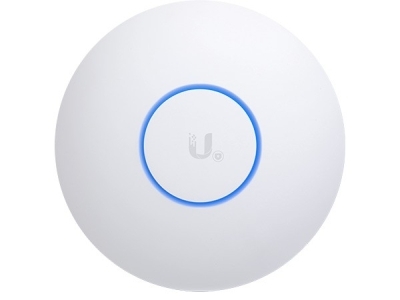 The Ubiquiti UAP-AC-SHD is a professional MU-MIMO access point with Wireless-AC Wave 2 technology. The access point is equipped with 4x4 dual-radio transmitters and achieves a maximum speed of 2.35 Gbps. Unique is the built-in security radio that constantly monitors the network for threats. The Ubiquiti UniFi UAP-AC-SHD dual band access point provides a powerful WiFi network with sufficient capacity for busy (high density) environments. The access point supports 802.11ac Wave 2 MU-MIMO and can therefore serve multiple clients simultaneously at high speed. The device is suitable for both indoor and outdoor use and provides a transfer speed of up to 2533 Mbps. The powerful 4x4 dual-radio transmitters with beamforming ensure excellent coverage. Unique to the UniFi UAP-AC-SHD is the built-in security radio, which continuously monitors the performance of the network and detects malicious activities (Wireless Intrusion Prevention System). This allows the UniFi-AC-SHD to detect threats on time while optimizing client device performance. A major advantage of a dedicated security radio is that all WiFi channels are monitored and not just the channels on which the access point is active. The airView application provides insight into the total RF spectrum so that you can analyze all available RF channels in real time. Because the application uses the aforementioned security radio, the analysis can take place without affecting the performance of the network. And if you want to check the WiFi performance of the network, use airTime. With this application you can view the influence of SSIDs, stations, data streams and interference on the WiFi network, among other things. The UniFi UAP-AC-SHD is the first UniFi access point with Wave 2 MU-MIMO support. The advantage of this technique is that the access point can communicate with multiple clients at the same time, which was not yet possible with older access points. With Wave 2 MU-MIMO, clients benefit from significantly higher speeds and better WiFi performance. 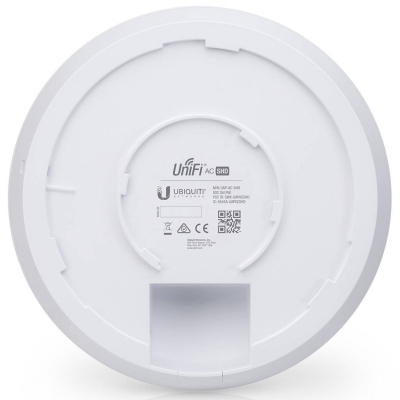 Thanks to the slim smoke detector design, you can unobtrusively attach the Ubiquiti UniFi UAP-AC-SHD to the ceiling or wall. 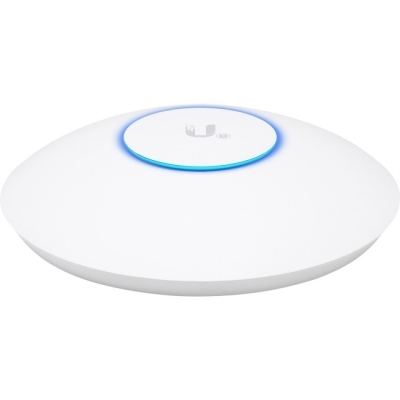 You connect the Ubiquiti UniFi to your router, after which you install and manage the access point via the free UniFi Controller software from Ubiquiti. The software is available for both Windows and Mac. The Ubiquiti UAP-AC-SHD supports 802.3at Power over Ethernet, or PoE +. 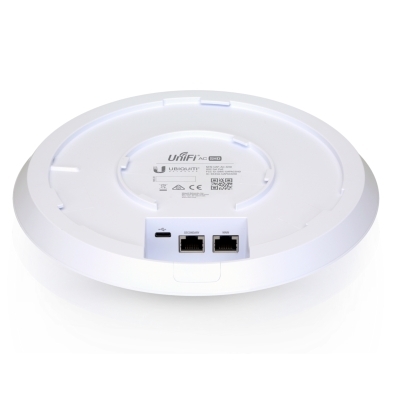 The access point can receive power via the network cable using the included 48V PoE injector. Do you use multiple access points? In that case we recommend using a (UniFi) switch that supports 802.3at. The UniFi Controller software is part of the Ubiquiti UAP-AC-SHD. This allows you to not only manage the access point, but also monitor network performance, identify problems, make analyzes and create a login portal for guests. If you use multiple access points, these can be managed centrally via the UniFi Controller. The software is very user-friendly and also suitable for people with little technical knowledge.